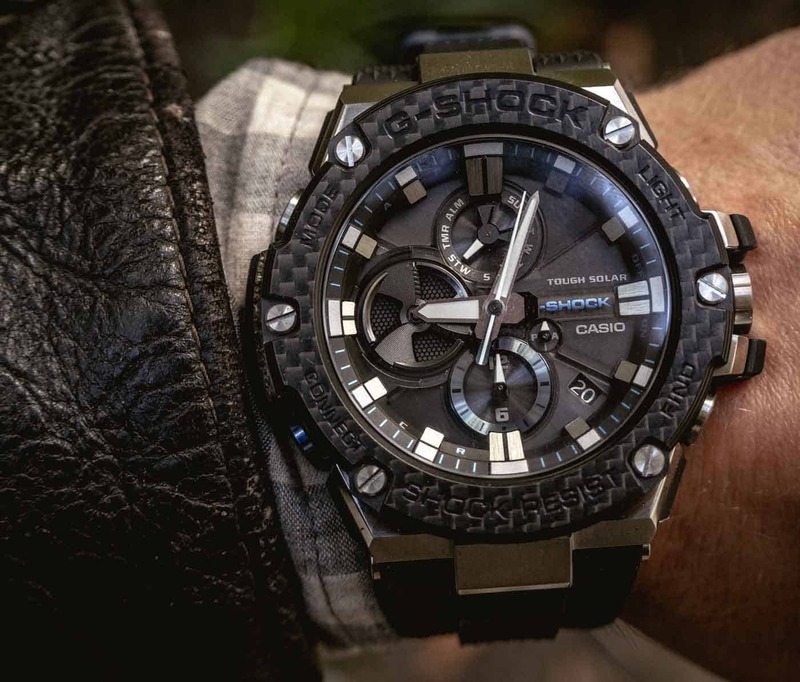 G-SHOCK is advancing their G-STEEL line with a new carbon-bezeled, Bluetooth-connected superwatch. Does it conjure images of Formula 1 race cars, with their intricate winglets and vortex-generating bodywork? How about the latest generation of stunt planes, stronger, lighter, and able to pull more G forces than ever before? Or maybe the latest in high-tech World Cup monohull sailing vessels, breaking speed and endurance records on a monthly basis? Then again, carbon fiber might connote a purely aesthetic quality: the impossibly light, smooth woven finish that just looks achingly cool. If you’re unfamiliar, here’s a quick introduction. The history of carbon fiber dates back to the 1870s, when Thomas Edison baked cotton threads at high temperatures, carbonizing them into filaments used in lightbulbs. Fast forward 100+ years and what we refer to as “carbon fiber” (most of the time) is actually carbon fiber-reinforced polymer – a carbon-reinforced plastic or polymer. Why go to all the trouble of fortifying our plastics with thin strands of carbon fibers? Because carbon is really strong… and really light. Carbon fiber has leaped into usage in military, aerospace, and sporting applications because it brings a unique combination of high stiffness, high tensile strength, low weight, high chemical resistance, high temperature tolerance and low thermal expansion to just about any kind of part, structure, or device. When you want something to be strong, but you don’t want to pay for it in increased weight – carbon is the answer. All qualities prized by clockmakers for hundreds of years. Now, carbon fiber – or, more accurately, carbon fiber-reinforced polymer – has been introduced to the G-STEEL line and it just might be our favorite entry yet. The G-SHOCK family of watches built their reputation on an aggressive approach to function. The original creators introduced the Triple 10 test as a standard by which to evaluate any new G-SHOCK: the watch had to handle a 10 meter drop, 10 atmospheres of water pressure, and have a battery life of 10 years to even make it out of the design stage. From a fashion perspective, G-SHOCK was all function. But then something happened. The function-first aesthetic caught on with everyone from streetwear tastemakers to military operators. It turns out, people liked having a watch that was virtually indestructible and relatively light on the wallet. The G-STEEL line is the latest evolution of the hyper-successful watch line, taking that same level of durability and adding more fashion form to it. G-STEEL brings to market a G-SHOCK watch for the smart casual set. As we’ve talked about previously, the G-STEEL is the superspy of watches. Built-in Bluetooth, a linked app, and auto-time updating every 8 hours ensure it’s always accurate – and a “find my watch” feature will even help you locate your G-STEEL if it’s lost while paragliding the Andes – or walking your pooch on your Sunday hike. Now, the carbon-festooned G-STEEL GSTB100XA-1A, with Tough Solar rechargeable energy and a 200 meter depth rating, is taking the G-STEEL line in a compelling new direction. 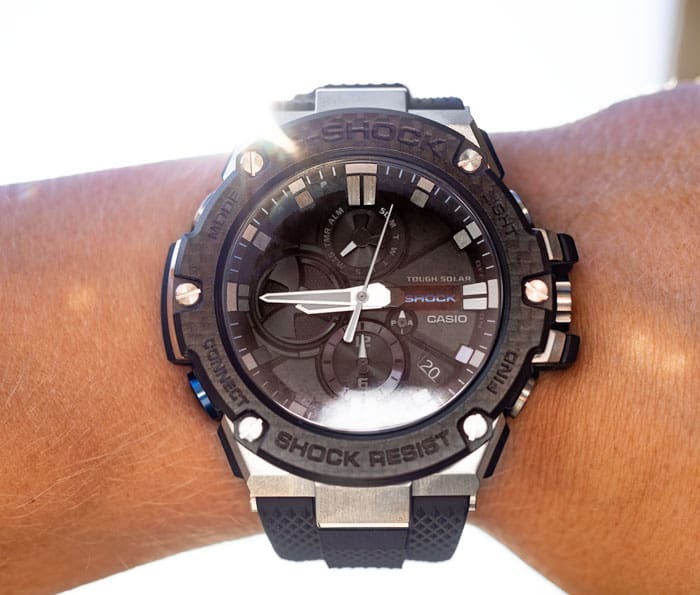 G-SHOCK G-STEEL is fueled by Tough Solar, an energy efficient way of capturing light and storing it with the capability of powering multiple performance functions at once. Carbon doesn’t just have to mean ultra-performance vehicles. Nowadays, you can pick up phone cases, bike helmets, tennis racquets, and even pocket knives made partially or entirely from carbon fiber. Carbon fiber, in other words, has been democratized. But that doesn’t mean it’s been diminished as a material. The process of manufacturing carbon-reinforced products is much the same as it’s always been. First, long carbon strands are woven in to sheets. Next, those sheets are molded to fit the application, like a bike helmet for example, and combined with polymers. Finally, the sheets are treated with high temperature and pressure to, in essence, cure them. The manufacturing process is inherent in carbon fiber’s visual appeal – the sheets of individual carbon strands are woven like a straw mat, giving it that signature checkerboard appearance. Why is that carbon fiber weave so appealing? 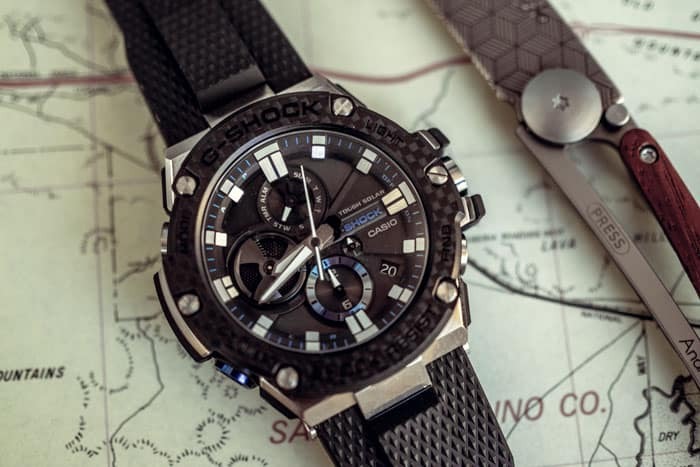 Just like stainless steel dive watches signaled worldliness and deep-sea adventure in the 1960s and 70s, carbon fiber today is the choice of professionals. Whether you’re designing a performance car part, or adding strength to a high-end mountaineering tent by using carbon fiber for the tent poles, it speaks to competency, technology, and the promise of pushing boundaries. One style item where carbon fiber has been most successfully utilized: the humble wristwatch. The first thing you notice about the imaginatively named G-STEEL GSTB100XA-1A is the fact that it feels like something an astronaut would wear. Not a space tourist who’s plunked down 250 large for a Virgin Galactic trip. A real rocket-riding, PhD-earning, hardass astronaut. The G-STEEL with a carbon-resin bezel is noticeably lighter than it’s all steel sibling and the beefy rubber strap inspires confidence it can take a hit and keep working. On a normal watch, the pins that attach the strap to the case are notoriously flimsy. On the carbon G-STEEL those thin pins have been swapped for hex nuts. The G-STEEL is built tough, all the way down to the hex nuts that attach the strap. The blue button is how you connect with Bluetooth. 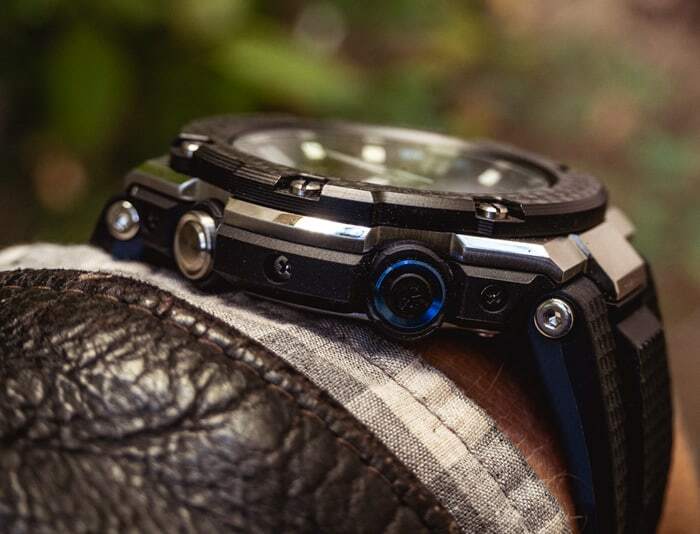 The carbon fiber bezel does what it’s supposed to: capture some weight savings and give the G-STEEL that air of technical polish that only carbon fiber can bestow. But the impressive tech isn't just on the outside. The G-STEEL line can actually use Bluetooth to activate its “Find My Phone” feature. That’s right: this G-SHOCK will make sure you don’t lose your phone. Weekend warriors, athletes, and anyone who has a pursuit where weight and durability are a consideration – take note. Whether you’re training for a marathon, taking off on a canoe trip, or hitting up your local climbing gym, the G-STEEL GSTB100XA-1A is an enviable combination of modern-connected tech, utterly rugged and carbon-enabled flexible. Back in the day, people bought Rolexes because they were the most durable thing around with the best tech available. Nowadays, man has pushed further and harder in the quest for performance and, honestly, a Rolex might not stand up any longer. If you’re looking for a watch that’s virtually indestructible and stylistically unique – this might be the one for your next adventure. What is your favorite application of carbon fiber? Share it in the comments below! This will go fantastic with my Ferrari Polo shirt until I can save up enough for a real Ferrari watch. What knife is that in the picture with the map? I bought the non-carbon fibre one based on your earlier article, and I’m amazed at how high quality a watch it is.